The newest cake blog design order from Mbak Dewi. 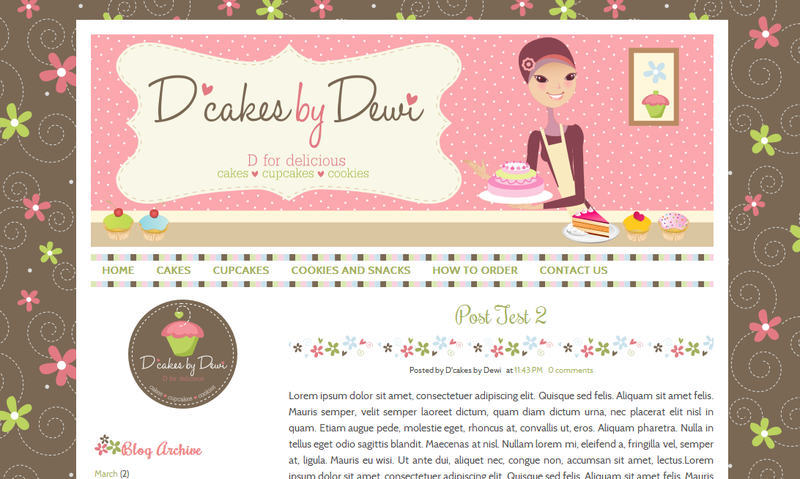 She ask me to design blog template with pastel colors such as brown, pink, green, or blue. She likes cute template so I combine the color, icon, background, and illustration. And this is custom blog design special for Dcakes by Dewi. I try not to use stripe background so I use floral pattern. The blog header, look at the classic and cute blog logo. Woman bring birthday cake and decorate some cupcakes describe what D'cakes by Dewi services. Additional design is sticker and blog banner. You can take a look the sticker at sidebar.